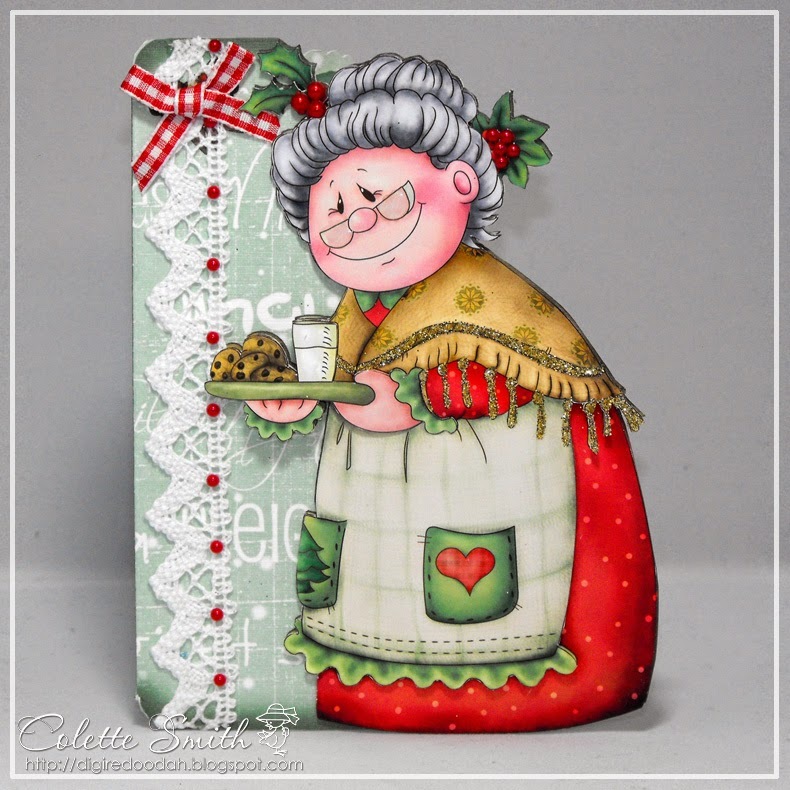 Here's my final Christmas card for this year, using an adorable image from Sugar Nellie. I've die-cut a couple of snowflakes from glitter card and decorated them with Meiflower 2mm and 4mm stick on gems for a different look, I also added a small diamanté buckle to the bow, which was made using a pretty pale blue polka dot satin ribbon. 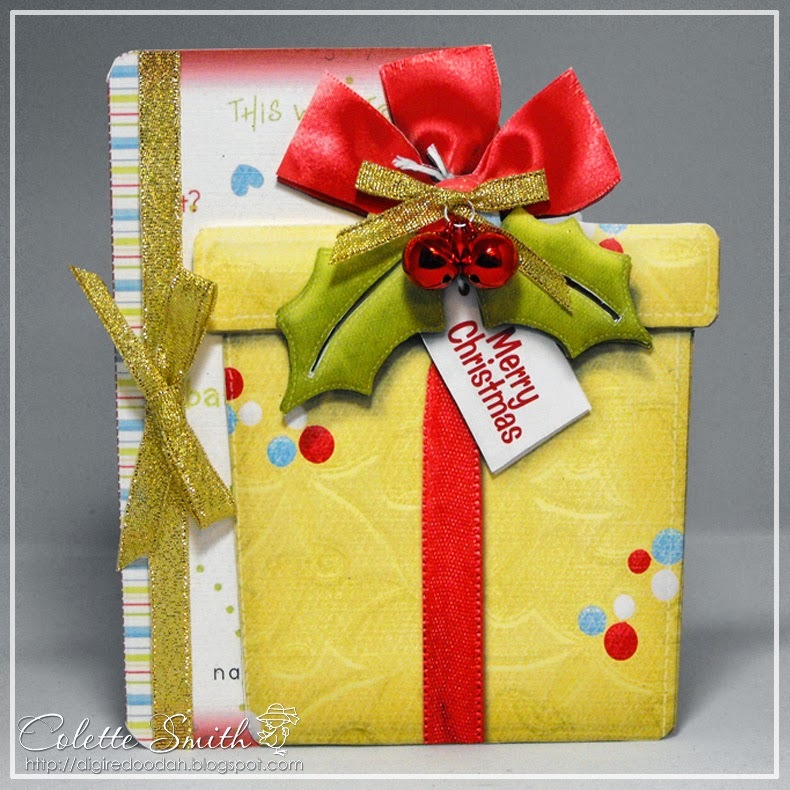 Today I have a couple of cards made using a new Mega Bundle from Paper Creator, the cards are quick and easy to make, so ideal if you are in a rush, and once made up you can decorate them as you please. I added a few Meiflower items to mine, a ready made gingham bow, red stick on pearls, gold lurex ribbon and large jingle bells. I have two cards to show you today which I made in early September as samples for Meiflower. For the first card I die cut lots of snowflakes from glitter card and dotted them randomly over the bottom two thirds of the card front, trimming off the overlap. 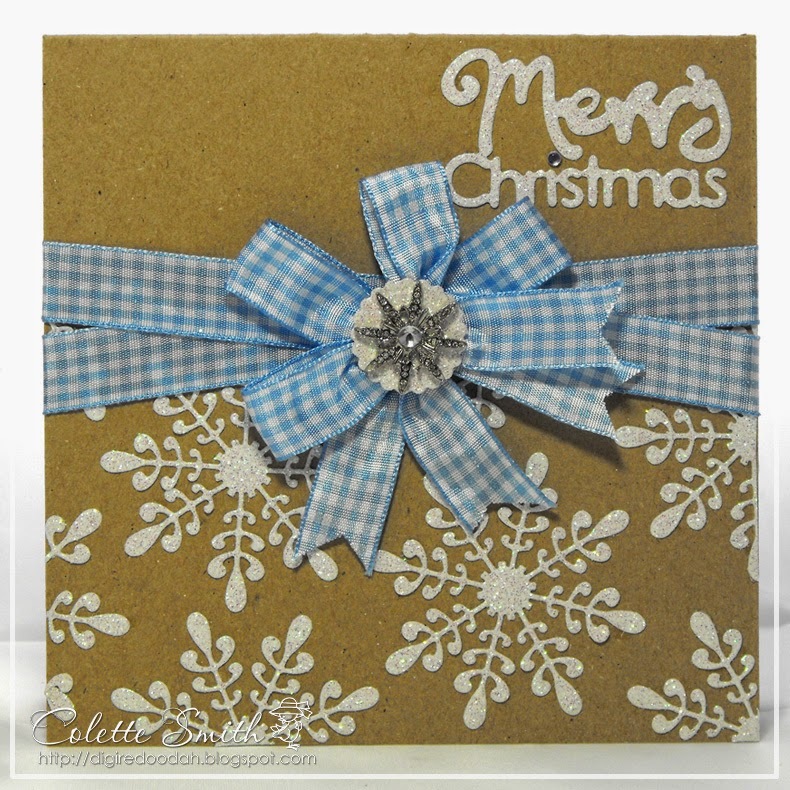 I added blue gingham ribbon, tying two bows and overlapping one over the other, then added a die-cut circle of glitter card and a diamante snowflake embellishment. I also die-cut the sentiment from glitter card. 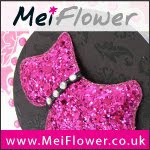 Ribbons, pearls and diamanté snowflake are all available at Meiflower. 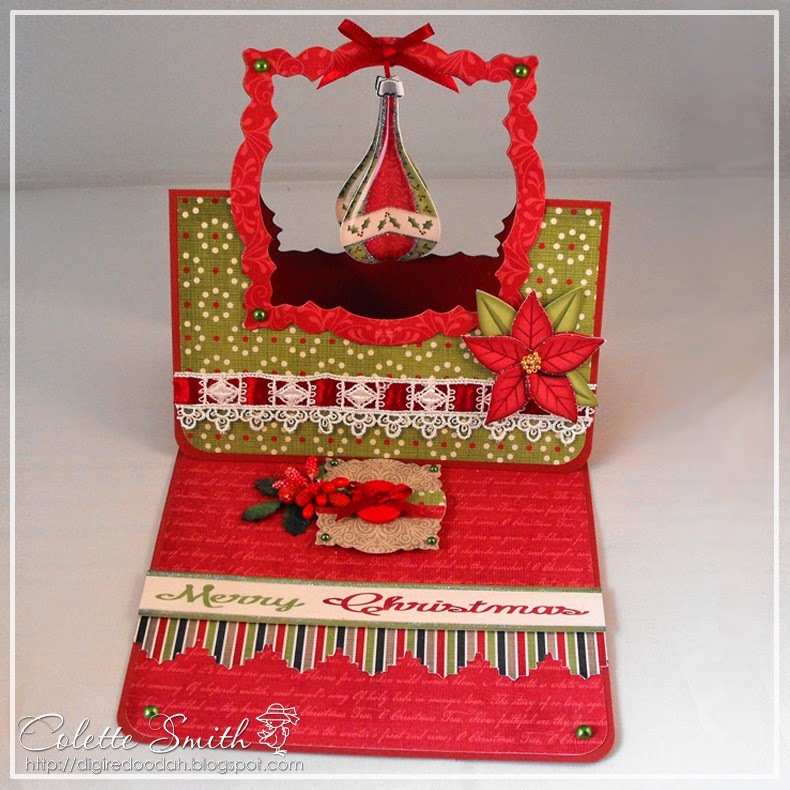 Here's an easel Christmas card I made, die-cutting a frame for the middle, then cutting out four baubles, creasing them down the middle and sticking them together back to back to make a 3D bauble, which dangles from the top of the frame when the card is open. 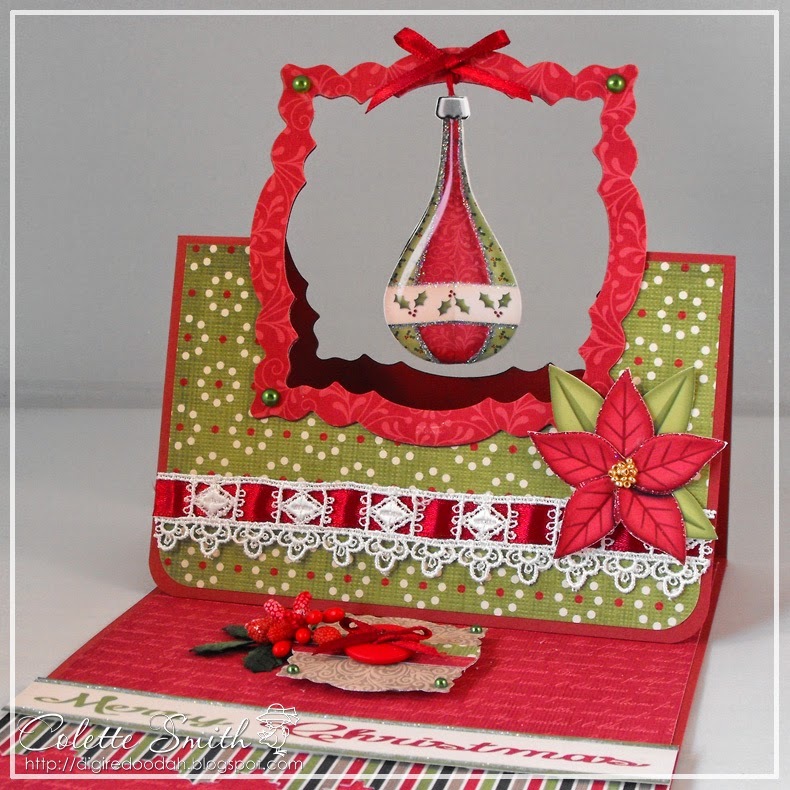 The bauble is tied to the frame with red metallic cord, and a narrow satin ribbon bow has been attached over the hole. I also added green pearls to each corner of the frame and the front corners of the easel base, just to give a bit of interest, and found some lace in my stash that was ideal for threading ribbon through, as usual, ribbon, cord and pearls are all from Meiflower.